Whilst listening to the regaling of tales from years yonder, one was also reminded of the pitiful lack of records outlining the pioneering roles people such as Malan, Bayly, Danie de Wet, Sydney Back, Spatz Sperling and Tim Hamilton Russell have played in the industry over the past fifty years. These are real icons, whose stories need to be told and their influence noted. I was privileged to meet Oom Frans Malan while studying at the University of Stellenbosch in 1987. My journalism class professor, Johannes Grosskopf, endeared himself to us one summer afternoon by loading the class into a minibus and hot-footing it to a wine farm. The destination was Simonsig and we were welcomed by none other than the patriarch himself. 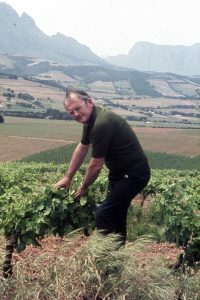 His sons Francois and Johan were then already working on the farm as viticulturist and wine maker respectively, giving dad Frans the opportunity to lead a bunch of kids through a tasting of his wines. Personally I was so moved by Oom Frans’s homage to wine and culture that I almost forgot to down my last glass of Kaapse Vonkel. Oom Frans passed on in 2003, one day after his 75th birthday. 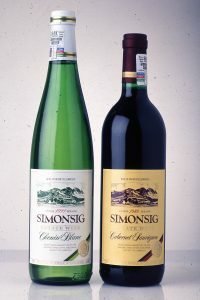 But the current 50th commemorative celebrations at Simonsig rightfully alerts one to the important role leaders and pioneers such as he played. Long may their legacies live. Wine farmers of Oom Frans’s ilk are, after-all, also made in the vineyard.